There are pattern available for coordinating baby blankets for both the fan lace and the tiffany lace. Have knitted a Breast Cancer Awareness Scarf using the Tiffany Lace (Classic Elite Yarns) That turned out well so can’t wait to try Baby Hat for new grand daughter. I KNIT A LOT OF HATS FOR PROJECT LINUS & MISSION OF HOPE, SO AM ALWAYS LOOKING FOR NEW PATTERNS. THIS PATTERN & A FEW OTHERS I’VE SEEN, MENTION MAGIC LOOP. WHAT IS THAT??? I USUALLY USE THE CIRCULAR NEEDLE FOR BOTH IN THE ROUND & STRAIGHT KNITTING. The magic loop is a method of using a long circular needle to knit in the round on small items such as socks or baby hats. There is a tutorial on how to use the magic loop at http://weebleknits.net/mloop.html. Before the magic loop, I always finished hats with double pointed needles so that the crown wouldn’t have a seam, but I didn’t enjoy using double pointed needles at all, so didn’t make many hats. The magic loop has caused me to finally really enjoy making hats. I just love these 2 hats; my 4th great-grandy is due in Dec, a little girl, so I’ll do a couple of these for her in different sizes. These are very pretty and so simple. Lovely for a little one’s head. Thanks for sharing. Love these two little hats and thanks for sending the patter. I’m wondering if you have the pattern modified for a bigger person(adult lady). Love the fan lace one on the left. If you use size 8 (5mm) needles and a worsted weight yarn, casting on 84 stitches will give an adult lady size. You will probably want to make the hat about 5.75″ before starting the crown decreases. When working the crown, I ended up with 36 stitches left. Do I pull yarn through all of these? I made a scarf using the tiffany pattern . I gave it to one of my relatives for Christmas and she loved it.. I am trying to make a hat to go with it and until now I didn’t even know it was called a tiffany lace pattern..she is an adult, so how do I go about making a hat for her in this lace pattern?? thanks for your help!! 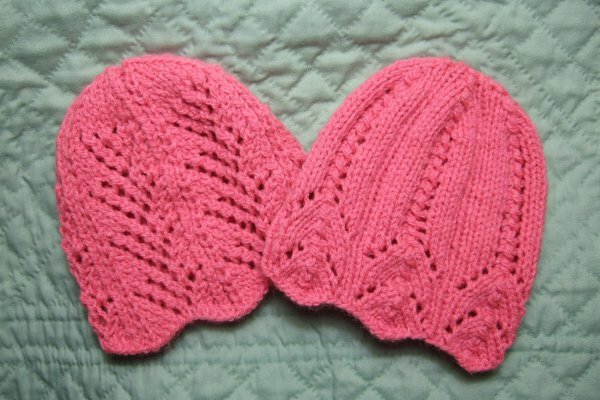 and thanks for identifying this pattern it is really pretty and My niece now wants one,also..
Just finished knitting the Fan Lace baby hat. What a delightful and interesting project. I so enjoyed knitting it. Next one – the Tiffany Lace hat. I knit for charity and have been told these little hats for newborns are a boon. I notice you are using the magic loop method I cannot find those where I live. Where do buy them?? I hope I hear from you in regard to this before I go shoping snd looking for one. I have a yarn shop near me that carries Addi Turbo needles. I would highly recommend the Addi brand, but they aren’t cheap. They are usually $25 or so. But they are the best quality circular needles I’ve ever used. You could call local shops to ask if they carry that brand. I have also found those at some online stores by Googling “Addi Turbo”. Depending on what size hat you are making, you could use a 16″ circular until you get to the cap reductions. Then you would have to move to double pointed needles or a magic loop. Can you help me understand K3-B a bit? Option 1: Knit 3 into the back of one stitch. Option 2: Knit into the back of each of three stitches. Option 3: I’m completely off base and please correct me. Sorry about that being confusing – option 2 – knit into the back of each of three stitches. Wow! You’re speedy! Thanks so much for the fast reply! I have tried making the fan lace several times. When I get to the 7th rnd I never have enough stitches to complete it. I was trying to make it using baby weight but have move to a little bit heavier weight just to be able to see more clearly the pattern. What do you think I might be doing wrong? I have gone over the stitches many times and just can’t seem to figure it out. Rnd 6 has 4 yarn overs per repeat. That would be the thing I would think most likely to cause problems. Is there an error in rd 2 of the Tiffany lace pattern? I ended up being reduced to 10 stitches for that set. Or did I do something wrong? I see my error. I YO to knit when I should have left the yarn in the P side to K.
Very pretty hats. My grand daughter is due in August, those would make very nice gifts for her. How to do these on straight needles?? TY! They are gorgeous and would be fun to do for charity. Thanks so much for the write-up! I enjoyed reading your blog. You have so many fun projects. Just switch to dpns whenever it starts to feel tight on your circular. You might be able to get through one row of reductions, but will probably have to switch with the second set. If you divide your stitches among the needles in multiples of 12, then you can make all the reductions without having to move stitches. Thank you so much for sharing this wonderful hat. Yes, the 48 stitches will be consistent until you start to decrease. Doing yarnovers between a purl and knit stitch is a bit odd. When going from a purl to a knit with a yarnover between, you can just leave the yarn in front when inserting the needle for the knit and it will form a yarnover. When going from a knit to a purl, you will have to wind the yarn around the needle a little more than usual to form the yarnover since you will also have to bring the yarn forward for the purl. Absolutely. You will probably end up in the larger part of the gauge so may need to cast on for a size smaller than you are making. Made both of these for the hospital’s purple program. Both turned out precious. Thanks. Thank you so much for so generously sharing both the fan lace and tiffany lace hat and blanket patterns. Thank you Mama for such a speedy reply.. I also do some charity knitting for babies. We are on a strict budget …retired… and this means more to me getting your beautiful patterns than anything. Thanks so much for sharing the link to your blog entry. I love it! I am using a combination of viscose (55%) and wool (45%) yarn it says medium 4 and to use size 5mm needles; so my question is, do I still use size 4mm and cast on 77 for my 4 month old? Yarn usually looks best using the size needles recommended. I’d recommend using the 5mm needles and cast on 60 stitches. Would you have a pattern for these 2 hats using straight knitting needles (not double pointed) where you sew the seam? Cut the yarn with several inches to work with. With a yarn needle, pull the yarn through all the remaining loops, secure, seam and weave in end. So in this case the k3-b is three of these stitches. Thank you for the lovely hat patterns. I make premie hats for our local hospital and I can hardly wait to make these in several different colours. I seem to be the only person here that can’t divide 84 stitches by 12. How do you follow the pattern only written for 12 stitches on each dpn? I’ve made socks on dpn for 40 years. I don’t get this. Thanks. You want to divide into multiples of 12. If you are using three needles, then 24/24/36. For four needles 24/24/24/12. My 1st attempt using “magic loop” was the Tiffany hat. MAGIC!!! Mama, I’m making the fan lace hat and am wondering how to measure the crown – from the “dip” in the edge or the longest distance from the “hump” in the edge? I’m loving these neat hats – I only knit for friends, but they will be getting more of these great hats. Thanks! When the hats are worn, the rippled edge stretches, so the differences in the dip and hump aren’t as exaggerated. So I think it is safest to measure to the halfway point of the dips and humps. I love the patterns and matching blankets. How do I keep the ends from curling? It is especially bad on the blanket. I’m using an acrylic yarn. Thank you. I think most people are blocking the blanket to solve that. I used a shiny cotton that didn’t curl quite as bad. The curling on the edge of the hat should be lessened when stretched, so typically doesn’t curl when worn. Yesterday I made the fac lace baby hat. I used Lions Pound of Love baby yarn. I found the pattern to be very easy to follow. It make up extremely fast. I found no errors in the pattern and totally plan to make it again. It’s just lovely! You might possibly be the best person out there, offering free patterns AND altering them when a person asks for the pattern in straight needles, not circular! I’ve never been able to wrap my mind around double-points, so this is a boon to me. I just bought several sets of the metal Addi circular needles in 12″ length, in sizes used for DK yarn. Worth every penny as they glide through the yarn. They were perfect for making the hat in the baby size, as the 16″ long needles are just a bit too long. Only had to do the last few rows of the decrease on double point, so this was really fast to make. Thanks a lot for the beautiful patterns. Going to try it immediately. It was very nice of you to take the trouble to give the pattern for straight needles too. Thank you! This is exactly what I was looking for and I didn’t even know what I was looking for! Yay! Blessings to your generous, beautiful spirit! Thank you so much for sharing these lovely baby hat patterns. Just made one for an upcoming grandie. Do you have patterns for matching booties and sweater? Thank you for posting these lovely, easy to follow instructions. I knitted them for adults and added a tassel. I really enjoy many of your patterns. I’ve made both of these hats. They have each turned out lovely. I have noted no problems with the patterns – which are lovely and much appreciated by those who receive them. I have also upsized the needles, with heavier yarn, and made each of them for little girls rather than infants. Very pretty, very nice! Thank you for sharing these patterns with us! Sorry. I don’t make knitting machine versions of my patterns. When you do a k-b, your yarn is still to the back, so just like doing a yo between two k stitches, you just wrap the yarn around the needle front to back before making the next stitch. Six year old Angel,l (McKinsey) undergoing Chemo and is loosing her hair. The toddler size of these hats makes a small child size. That yarn is the same weight as what is used in my pattern. It depends on the repeat of the pattern. I don’t mind outlining the modifications for you if it is online. BERNAT pattern as well as BERNAT yarn,(explained above)..the pattern is BERNAT HANDCRAFTER STRIPES CHEMO CAP no. 485. Use one size smaller needles than what is called for and cast on for the adult size and it will work out to be the child size. just finished the fan lace cap, it is absolutely gorgeous and the picture does not do it justice, very clever idea to simplify the pattern by using multiple dons. Thank you so much for sharing your pattern for free. It is so much prettier than any of the major brand patterns. I will be knitting your patterns again. Use a size 8 (5mm) needle. Cast on 72 for 12 month and 84 for toddler. Another knitting 101 question: the cast on row is not considered the first row? Do I have that right? Thank you. I used a size 6 16″ circular to knit the 6month size and stitch markers between each 12 stitch pattern repeat and it’s working great, love these patterns, thank you! If I wanted to make this on an adult size using the same weight yarn, house many stitches would i need? Love to knit, but horrible at math, lol. If you cast on 120 it will make a 21 inch hat. Hi, your hats are beautiful. I’m confused about dividing the stitches into 12 on each dpn. For the small preemie, there’s 4 needles plus the extra for knitting off the stitches? Thanks! Divide the stitches by multiples of 12 onto your needles, so by 12, 24, or 36 per needle. This will keep the reduction stitches from using stitches from two needles. If you were making the small preemie size and wanted to use three dpns you could put 12/12/24 stitches on the needles. How do you measure needles in the round? Do I measure the cord and the needles or just the cord? New to knitting in the round! Includes the needles – tip to tip.